This Lake Las Vegas Homes and Community Video Tour will give you a bit of a feel for this amazing Master Plan in the southeast Las Vegas Valley. With it's Mediterranean inspired styling centered around a 320 acre lake, it's one of the many unique places in the valley to call home. With Homes, Condos, Town Homes, and Multimillion Dollar Luxury Estates with lake, golf course, and mountain views, it offers home buyers a variety of luxury living options. For those that just visit or vacation, you might want to look around Lake Las Vegas, as it's also a resort community. It offers Westin and Hilton resort hotels, Aston Montelago Village Resort Condominiums, the public Reflection Bay and membership South Shore Golf Clubs, a variety of water sports, hiking and biking, or simply a getaway for relaxing in a tranquil setting. It's hosted a number of meetings and events, and also used as a presidential retreat. As a REALTOR®, I show, sell, list, and preview homes all over the Las Vegas area, and am very familiar with the many home and community styles found here. Years ago, before making our own move to Las Vegas, we drove around the valley to see what areas fit our own personal tastes and needs. It's something I suggest to those who aren't familiar with what lies beyond the Las Vegas Strip, and this tour will help introduce you to one of them. As you'll see in the video, Lake Las Vegas is a world away from the world famous resort corridor of the Vegas Strip. Yet if you want to take in all that it has to offer, it's only minutes away. So let me take you on a drive through Lake Las Vegas in Henderson, NV. It's a quick glimpse of this 3600 acre Master Plan that gives you a look at the layout of some of the individual neighborhoods, the home styles, the views, resort areas, recreation, and all the renovations and preparations for new home construction that are happening right now. Let me just add a related video from a another recent post with more information. Galleria Dr. adds a second connection to Lake Las Vegas. It skirts the Clark County Wetlands Park, the largest in the Las Vegas Valley, while offering more interstate access along with connecting to a new water park, retail and hospitality, and Union Village, a one of a kind mixed use medical village that recently broke ground. So take a drive through this final connecting stretch with the colorful desert mountains and trail access, and even get a bit of TV trivia along the way. I hope these quick tours give you some idea of what Lake Las Vegas has to offer. It's a spectacular community that celebrities and executives call home, while offering a selection of family neighborhoods, all in this spectacular setting. 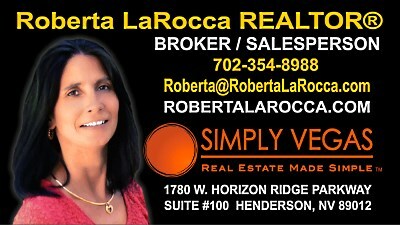 As I mention here and in my profile, there are so many community options found in and around the Las Vegas Valley. If you are interested in finding the home that's just right for you, or listing your Las Vegas home for sale, I hope you'll allow me the opportunity to assist you. 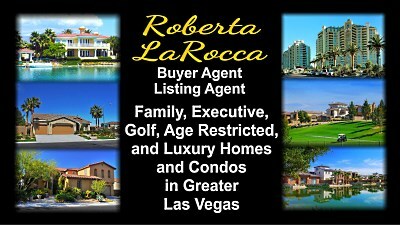 I can be reached by email at Roberta@RobertaLaRocca.com or call 702-354-8988. I look forward to hearing from you! I am now living in Sun City Anthem and. I must say this is best decision. We have made buying a home in Anthem ...its living in a resort. Everyday ! Love this video! 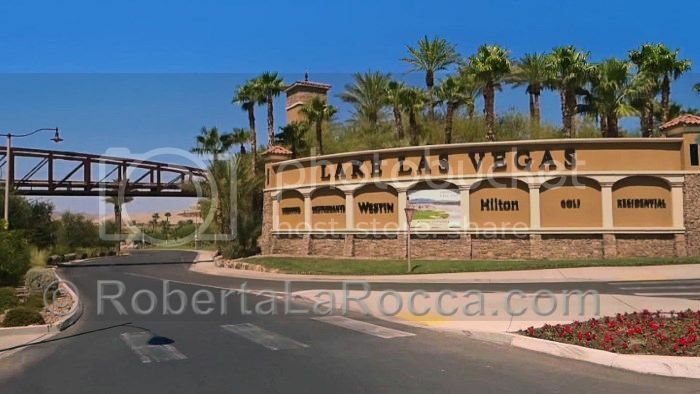 April 2015 moved from Southern California to Lake Las Vegas and it is living in a resort area!